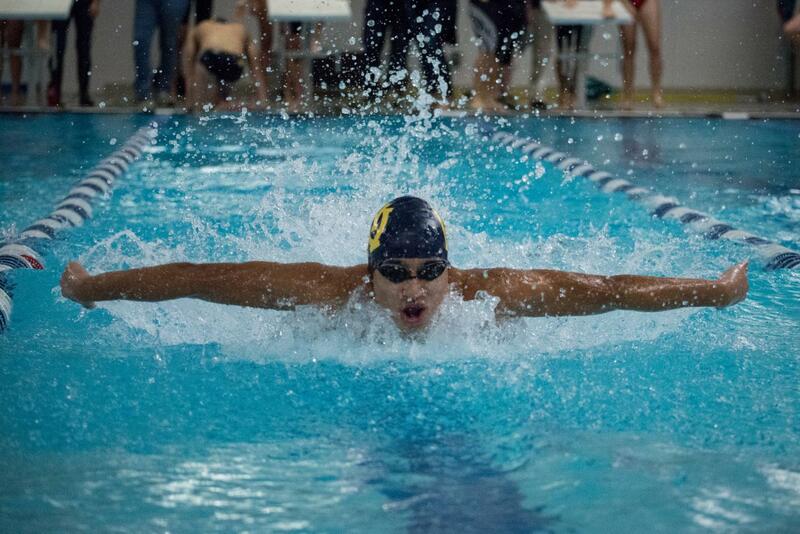 Rowan Chatterjee, ‘20, torpedoes through the water at a swim meet against Loveland High School on Dec. 11. He swam the butterfly stroke as part of WHHS’s 200 yard medley relay, along with Clovis Dufourg, ‘21, Alex Krietemeyer, ‘20 and Xavier Reblando, ‘22. The medley team finished in second place in this race with a time of 1:45.97. In WHHS’s newly renovated pool, The Natatorium, the swim team practices almost every day for their next meet. They hope to win, and based on past records, WHHS has a very strong chance of success. The swim team has dominated year after year with new pool, school and conference records. Many of these records are only fixed for a few weeks until a hard working individual on the team pushes to beat it. Records for them are just lines that are capable of being erased with training and practice. A team is not a team without its players, and the WHHS high school team has 63 of them. Recently, one of these players broke another school record–Phoebe Wright, ‘22. Wright beat the school record for 100 meter backstroke with a time of 59.79 seconds. The previous record from 2015 was 1:00.06 seconds. But the accomplishment did not come easily. “I swim from two to two and a half hours per day,” she said. Such consistency can shorten her time by a few seconds. Those few seconds can be the tipping point to her winning meets and beating records. Therefore, she takes her practices seriously. Phoebe Wright, ‘22, rests after finishing a race at a swim meet against Loveland High School on Dec. 11. Training year-round with both school and club swim teams, she believes this dedication is what allows her to compete at such a high level each meet. “I swim from two to two and a half hours per day,” Wright said. At age five, Wright began her journey to be the swimmer she is today when she first learned to swim at Clinton Hills Swim Club. “I liked it so I started competitive swimming,” she said. For about nine years, Wright has been practicing her backstroke (her preferred stroke) and working to become a seasoned swimmer. When she arrived at WHHS, she planned to continue her favorite pastime and joined the junior high team in seventh grade. In her first year on the high school team, Wright hopes her hours of practice will show in her journey to State Championships. With her sights on States, she continues to also aim high with her club swimming, Mercy Healthplex Sea Wolves. “There are some national meets that I want to go to,” Wright said. The first goal is making it to the meets, but winning first place is the ultimate prize. Not only is she a successful athlete, Wright manages to have strong grades while swimming throughout the year. She manages to maintain her grades through time management. She “makes time at home and after school and after swimming to do… homework,” since academic success is crucial to her as a student at a college preparatory school. Wright wants to be recruited and to continue swimming in college. As a ninth grader, it is not expected of her to know her career choice, but one thing is certain in her future: swimming will be there. Aaron Sequeira, ‘20, prepares to dive into the pool to begin a race at the Dec. 11 swim meet against Loveland. Sequeira has also set new swimming records at WHHS and hopes to continue to improve as an upperclassman. Wright is just one member of the team, and it takes the entire team to create an overall successful 2018-19 season–along with a strong coach to guide players. The coaching from Jennifer Golden, a swimmer herself from California, is a contributing factor to the team’s wins. With Golden at the helm, the men placed twelfth and the women placed eleventh out of about 100 teams at the Southwest Coach’s classic in 2018. 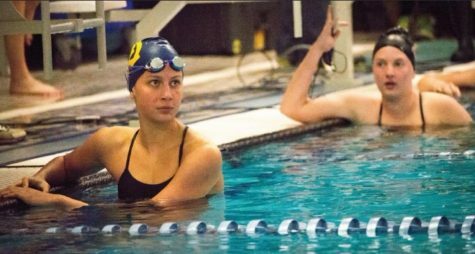 The swim team is difficult to overlook considering the amount of records and wins coming from the men’s and women’s teams. Each year, they prove to themselves, to their parents and to the school that they are worth acknowledging.